She was watching me as I was watching her (above photo). 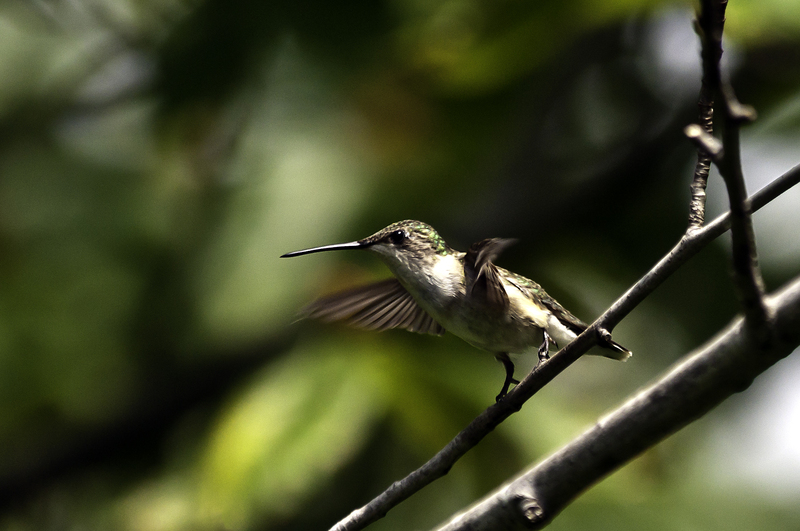 Below, I caught her as she was beginning to take off. And finally, one more image (below), when she was back in the tree. 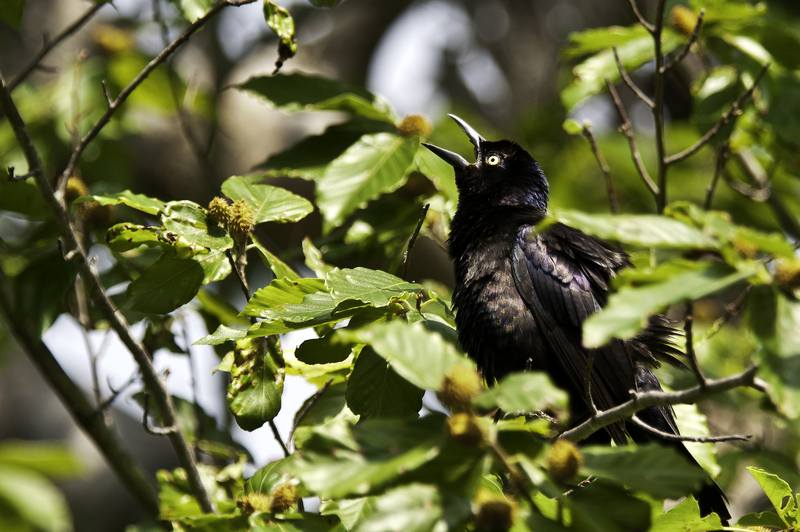 Common Grackles live up to their name and are way too common here. However, I could not resist photographing this one (below), because the sun was making its iridescent feathers glisten as it was perched up in a tree and screeching loudly. As you probably know, they do not have a pleasant call. 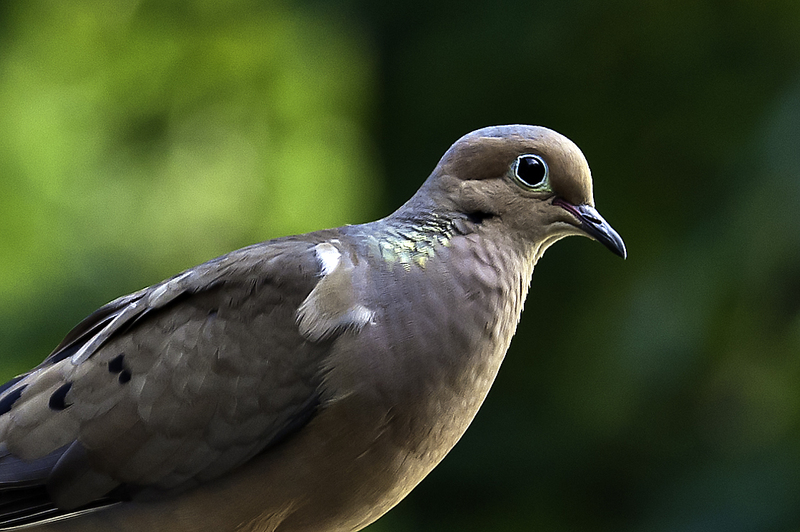 Mourning doves (below) are also very common, but have you ever looked closely at one? They are very colorful with gorgeous blue eyelids, blue feathers on the top of their head, and blue and yellow feathers on their shoulders. 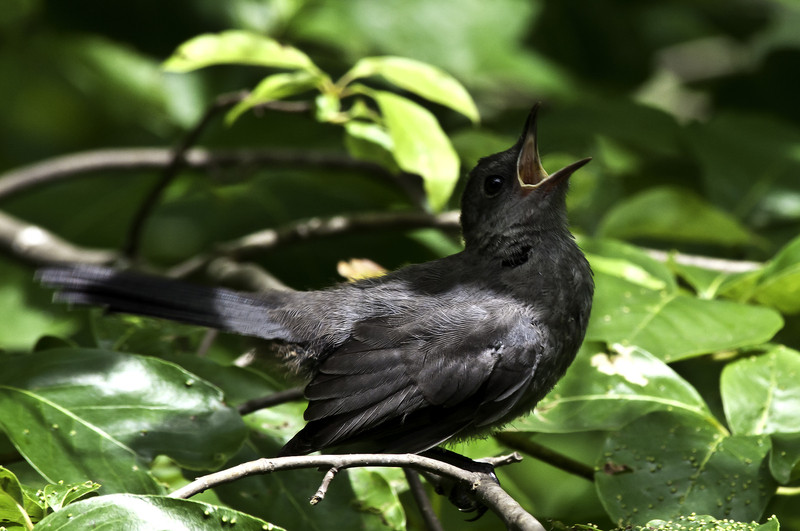 In early summer, recently hatched birds fledge from their nests, but still follow their parents around begging for food. Below are two fledglings–a Catbird and Red Bellied Woodpecker. 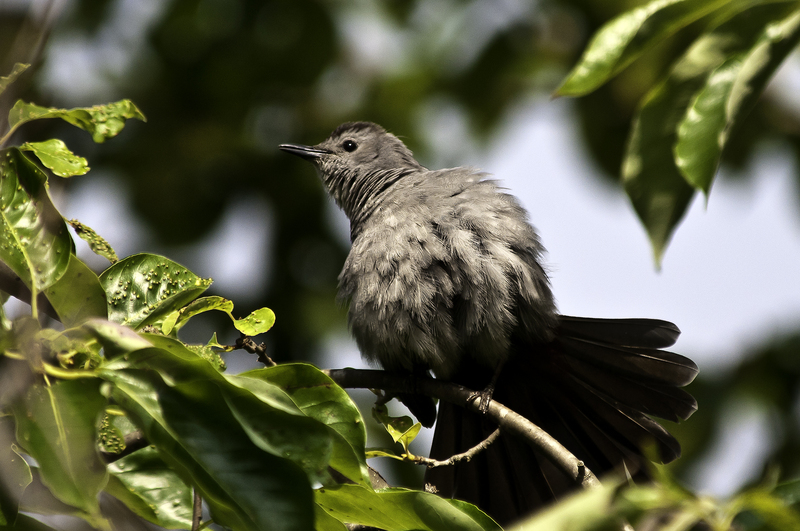 The young Catbird was impatiently waiting to be fed, and the shy, young woodpecker was partially lit by the sun while hiding in a tree waiting for one its parents to return with a meal. 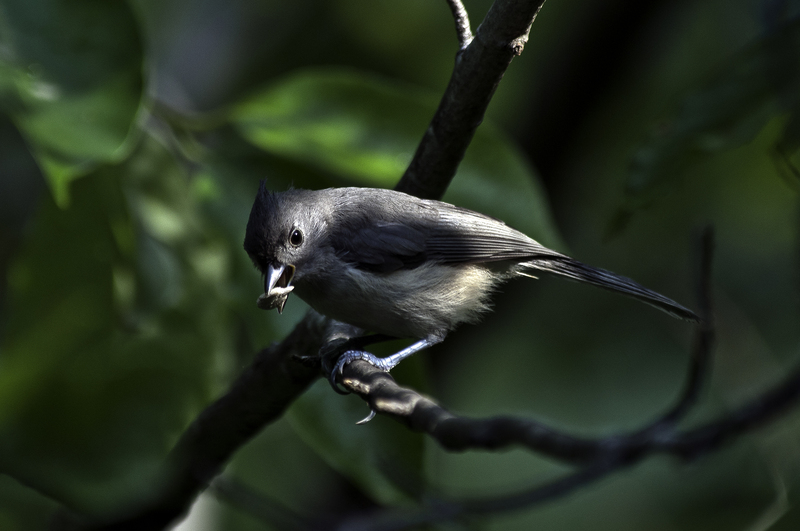 A couple more bird images follow–one of a Titmouse about to eat a seed (also partially lit by the sun) and the other an adult Catbird fluffed up while preening its feathers. 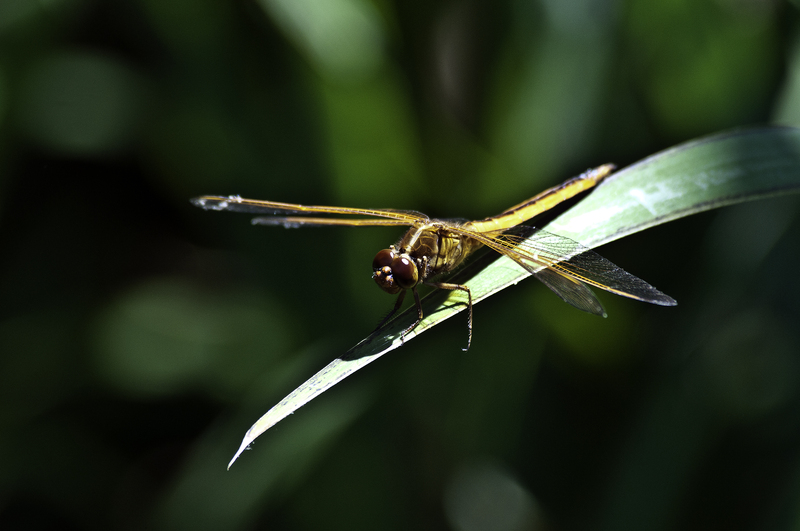 One last photograph–a dragonfly shot a Leesylvania State Park–obviously not a bird, but they do fly. Be sure to click on this image. They appear to have a face with very large eyes and a nose above their mouth. 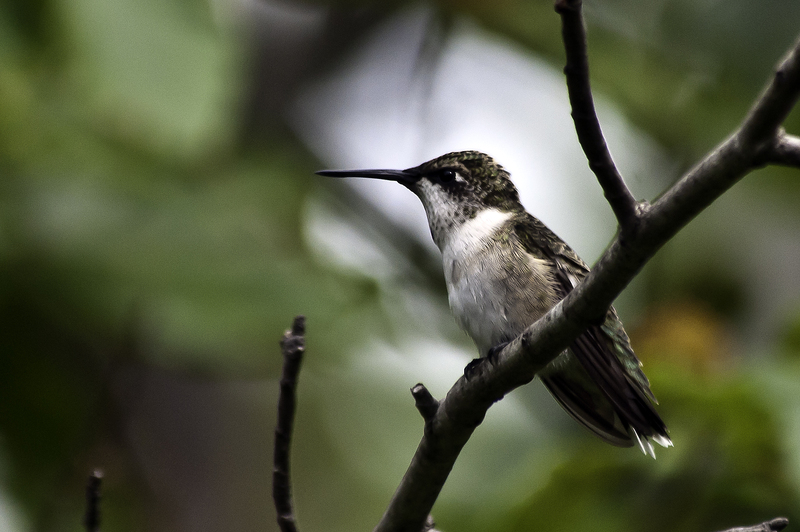 All of the above images were shot with a Nikon D300 and Nikkor 80-400mm VR lens. Tomorrow, its back to Italy. 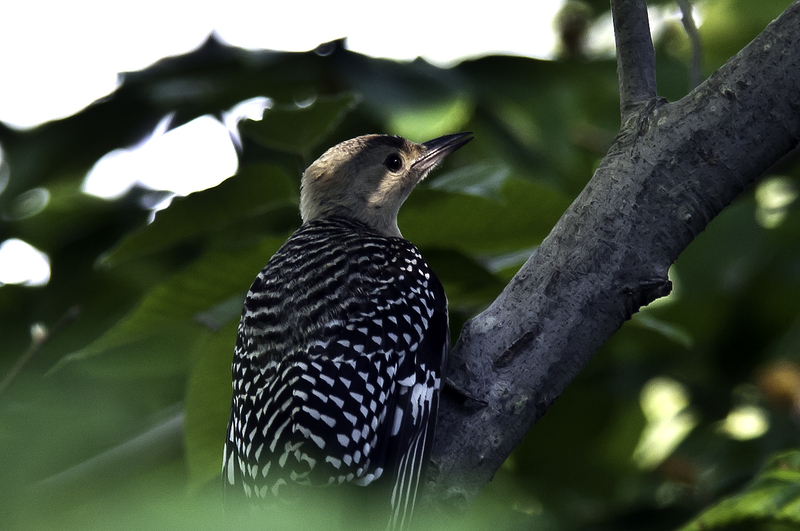 This entry was posted in Bird Photographs, Leesylvania State park and tagged birds. Bookmark the permalink. Your photos are always worth the look, Steve. 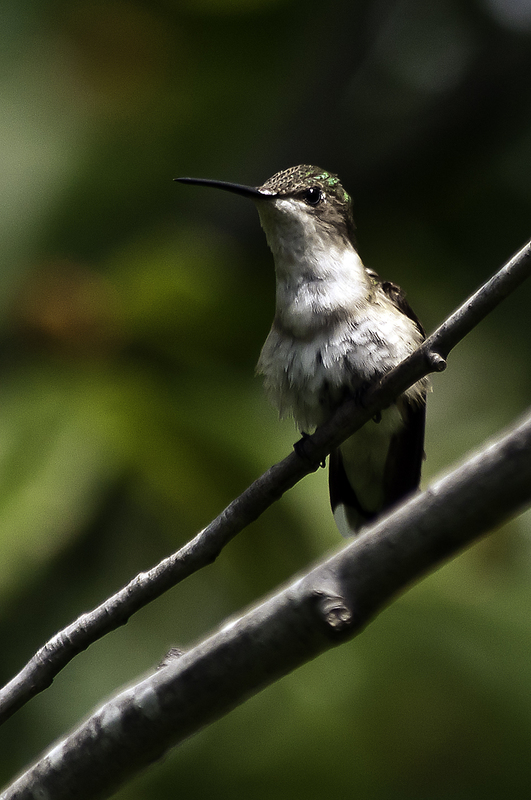 I enjoy your commentary and fresh look at not only the spectacular but the everyday backyard birds! Keep’em coming! Thank you Ann. It’s great to know you and others are enjoying them. Thank you Macie for your comment and for helping the dove. I am cheering too.